Replacing your missing teeth with dental implants and implant-retained teeth may allow you to live your life more fully. When your treatment is complete, you should be able to chew, speak, and socialize without experiencing the negative emotions that having missing teeth or hard-to-wear dentures can sometimes cause. Dental implants can also eliminate the need for denture adhesives. Dental implants and implant-retained teeth will help minimize the amount of bone that will be lost in the areas of missing teeth. Preserving oral bone may help maintain your natural facial contours. Also, replacing your missing teeth may reduce the risk of having the poorer nutritional habits often found in patients who do not replace missing teeth. Implants never decay, so if you have lost teeth due to cavities rather than periodontal disease, you are a great candidate for periodontal implants. While dental implants have a long term high success rate, an average of 10% to 20% of dental implants suffer from various complications. One of the most commonly seen dental implant complications is bone loss around dental implants called peri-implantitis. There are many different treatment options for peri-implant diseases, and one of the most successful modalities is guided bone regeneration (adding bone and membrane to the ailing implants). Other treatment options include laser therapy and local or systematic delivery of an antibiotic. Drs. Barber and Ho have rescued many ailing implants and have saved patients from losing their implant restorations. If you are told by your dentist or hygienist that your implant is in trouble, please contact our office today to see Dr. Barber or Ho. Improved Ability to Chew and Speak – Removable dentures have a bad habit of shifting and sliding, which can cause sores on the gums and cheeks. This can also make eating and talking difficult and embarrassing at times. Implants are surgically set into the jawbone, so there is no risk of this occurring. Other Teeth Will Not Be Affected – Other prosthetics like dental bridges require attaching devices to other teeth or grinding down parts of teeth to accommodate the prosthetics. With dental implants, there is no need to do anything to the surrounding healthy teeth, and they can remain perfectly intact. Durability and Longevity – Implants from Loop Perio are made from biocompatible titanium and implant crowns are made from materials that mimic the look and feel of natural teeth. The titanium is much stronger than most teeth, and with proper and regular care, your high quality dental implants can last as long or longer than your natural teeth since they never decay. 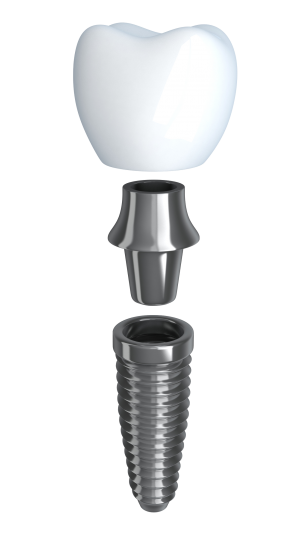 Convenience Feature – Unlike many other professional dental prosthetics, dental implants are made so that they will fuse with the bone of the jaw. This makes them long lasting and means there is less chance of needing new implants. You don’t have to worry about taking them out each day because they are screwed into the bone. Our high quality dental implants and professional dental prosthetics can help you get back your healthy beautiful smile!